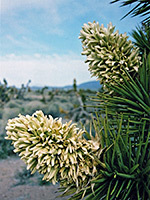 Yucca brevifolia is the most recognized US member of this genus, even though many people know the plant only by its common name, the Joshua tree. The yucca is a typical species of the Mojave Desert, found across large areas of east California most notably in Joshua Tree National Park and Mojave National Preserve; its range extends to many scattered locations in the mountains of south Nevada, the Beaver Dam Mountains on the Arizona-Utah border, Grapevine Mesa in northwest Arizona, along the road to Pearce Ferry, and further south in the state alongside US 93 (the Joshua Forest Parkway). Unlike most yucca which branch only occasionally, the Joshua tree does so profusely, soon becoming large and tree-like, up to 50 feet high. The narrow leaves (6 to 13 inches in length) persist only on the endmost foot or so of each branch, but dead leaves stay for many years, merging with the bark-like material on lower limbs. 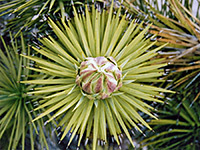 Branches form only after flowering, which usually occurs in spring each year but may not do so after a dry winter. The yucca was first named by Mormon pioneers in the nineteenth century, who thought that the upturned branches resembled the arms of the prophet Joshua, pointing the way to the promised land. Some authorities recognize a dwarf variety, var jaegeriana, the miniature Joshua tree.